The first image that popped into my mind at the mention of chestnuts is that of a pushcart manned by a man in bermudas hard at work frying the dark brown chestnuts amidst a big wok of charcoal....never, never as fruits growing from a tree. And this explains my look of amazement to find them staring at me within such close proximity! 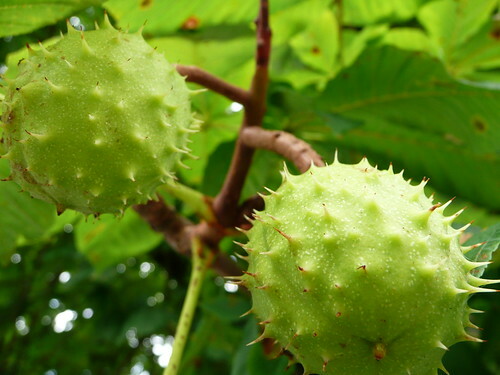 However, the joy was short-lived as I learned that the one I'm witnessing is a Horse Chestnut tree which produces inedible chestnuts, unlike the Sweet Chestnut tree, it's edible counterpart.